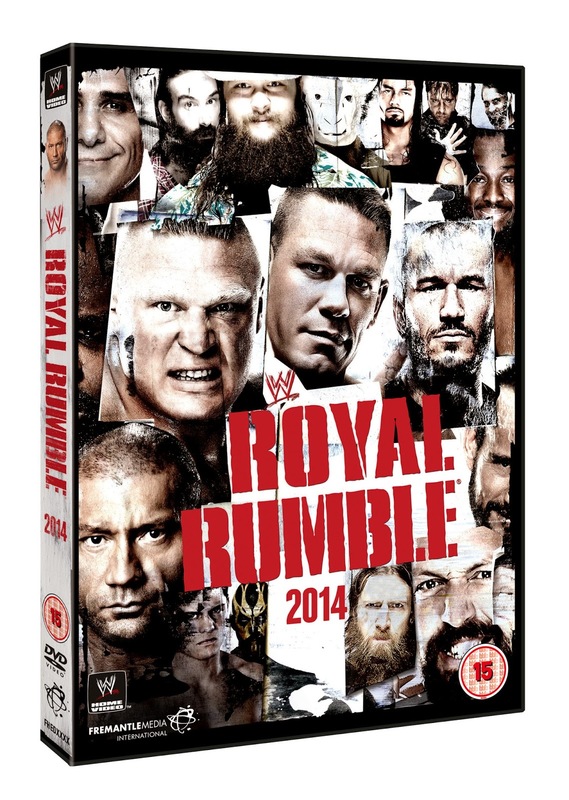 WWE Royal Rumble 2014 is out on DVD and Blu-Ray now, available from www.wwedvd.co.uk, priced £12.99 on DVD and £13.99 on Blu-Ray. Broadcast live on Pay-per-View from the Consol Energy Center in Pittsburgh, Pennsylvannia, USA on 26th January 2014, the show is main evented by 2014 Royal Rumble Match, alongside Bray Wyatt taking on Daniel Bryan and Randy Orton defending the WWE World Heavyweight Championship against John Cena, as well as one other match and nine different segments. The special features include one more bout, as well as three extra segments. The commentary is provided by John Bradshaw Layfield, Michael Cole and Jerry Lawler. After struggling to find form throughout the end of 2013, the first PPV of 2014 seemed to see an up turn in fortunes for WWE. Whilst many bemoaned the finish and result of the Royal Rumble main event, on a second viewing three months removed from the match, it is an enjoyable near hour of action with plenty to keep the viewers attention. To date this match is the final appearance of CM Punk on WWE television, and in line with much of his later work in 2013, it's an average one, with the highlight being a Neckbreaker/DDT combination delivered to Seth Rollins and Damien Sandow early on. Kofi Kingston continues his run of inventive ways to prevent elimination, with two impressive feats here, even if the first is slightly contrived. Roman Reigns and Antonio Cesaro are the stand outs in this bout, with Reigns continuing to be booked as a beast and Cesaro swinging everyone in sight around the ring. A showdown between The Shield and The Wyatt Family is cut short as the camera cuts to Ryback's entrance, which is a shame. We also see the seeds planted for the break-ups of both The Shield and Cody Rhodes & Goldust, as well as the beginning of a feud between CM Punk and Kane all of which have yet to come to fruition. The negative crowd reaction to Rey Mysterio's entry would seem to have been toned down in post-production, although a messy hurracanrana from Mysterio to Punk is still included. The crowd picks a favourite for the final two and unfortunately the other man wins, leading to more negative response for the crowd. Luckily, WWE managed to turn things around in the months heading into WrestleMania, as the booking here was certainly ill-advised, however the bout itself still offers a lot to enjoy. Elsewhere, Daniel Bryan and Bray Wyatt put on an excellent bout that picked up ATPW's Match of the Month for January. There's plenty of hard-hitting action on display, with Bryan working Wyatt's leg after sending Wyatt clashing into the steps and Wyatt working Bryan's head following a concussion a few weeks prior. Whilst Wyatt's leg injury is forgotten latter on in the bout, a handful of lovely false finishes and Bryan's excellent selling lead to this one ending up a very very good opening contest and most certainly match of the night. The WWE World Heavyweight Championship contest see's Randy Orton defend against John Cena in a decent bout, with the crowd once again seemingly having their volume turned down as they attempt to show their displeasure. Whilst I agree with the crowd to some degree, they do miss out on a solid title match with plenty of false finishes. There isn't much we haven't seen before, bar a full nelson into a neckbreaker from Cena, but it's still an entertaining battle. The other match on the main feature, see's Brock Lesnar take on Big Show. The crowd really couldn't care for Big Show as a babyface at this point, so Lesnar's brutal attack of him doesn't quite pay off as well as it should. However this is probably the best this bout could have been booked in 2014. Throughout the show we also get a number of segments to build towards the matches, kicking off with Renee Young conducting an interview with Paul Heyman. Heyman's talk of Lesnar challenging the winner of the WWE World Heavyweight Championship is another story thread that was left hanging on the Road to WrestleMania, but as expected Heyman pulls off a top quality promo. Young also interviews Randy Orton, who has less success with his promo, really not helping to build any excitement to his match with John Cena. To round of the trifeca of interviews Young speaks to Billy Gunn and Road Dogg about winning the Tag Team titles on the Kick-Off show, in a mildy amusing segment, even if the New Age Outlaws continued to act like babyfaces. We also get two segments featuring the Kick Off Show panel of Josh Matthews, "Hacksaw" Jim Duggan, "The Nature Boy" Ric Flair and "Mr. WrestleMania" Shawn Michaels, both of which are rather strange. The first discusses Bryan vs. Wyatt and Show vs. Lesnar with Michaels putting over Bryan strong despite having cost him the WWE Championship only three months prior. The second see's Duggan, Flair and Michaels pick their winners for the Royal Rumble, with Flair going completely crazy, when the crowd doesn't share his support for Batista. The Shield cut a fantastic build up promo for the Rumble, teasing tension between Ambrose and Reigns. A tribute to the recently passed Mae Young is beautifully moving, with a lovely voice over from Stephanie McMahon. There's also a package with a number of promos from entrants in the Royal Rumble, with Fandango putting in the best performance, whilst Batista's makes you wonder why WWE decided to push him as a babyface upon his return. The Special Features presents the Kick-Off Match seeing Goldust and Cody Rhodes against Billy Gunn and Road Dogg in a bout which has it's moments, but could have done with an extra five minutes to really get going. A segment seeing Vickie Guerrero and Brad Maddox hand wrestlers their Royal Rumble numbers is a dull piece of backstage action with the only bit that made me laugh being the video cutting short before The Great Khali could draw his number. Randy Orton being interviewed by Renee Young after his match is too short for anything of note to occur, whilst Young catching up with Batista only serves to illustrates how blown up Batista is after being in the Royal Rumble for just twelve minutes. Overall, I enjoyed this PPV a lot more than I did at the time. Daniel Bryan and Bray Wyatt steal the show with their effort, whilst both the Royal Rumble match and John Cena vs. Randy Orton benefit from being watched three months removed from the actual event. The DVD extras aren't great, and whilst the tag team bout is entertaining, all three segments don't offer much new. 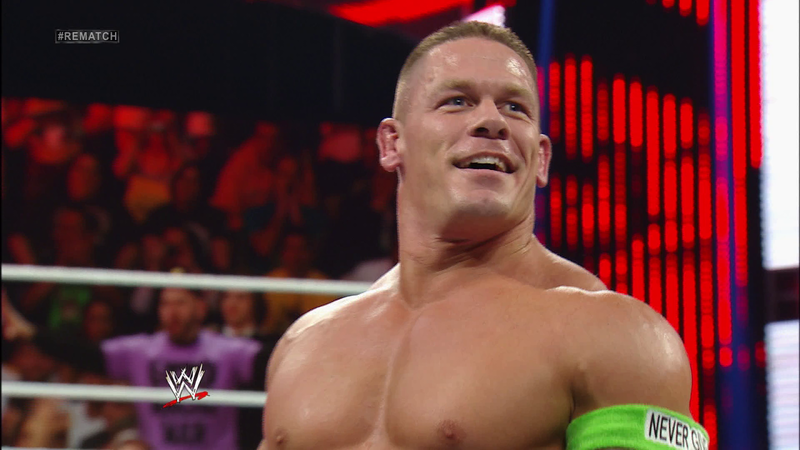 Match 3: John Cena vs. Randy Orton (C) for the WWE World Heavyweight Championship. Match 5: Road Dogg & Billy Gunn vs. Goldust & Cody Rhodes © for the WWE Tag Team Championships.